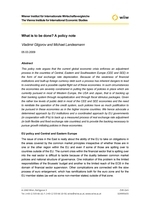 This policy note argues that the current global economic crisis enforces an adjustment process in the countries of Central, Eastern and Southeastern Europe (CEE and SEE) in the form of real exchange rate depreciation. Because of the weakness of financial institutions and built-up foreign currency debt such a process has inherent dangers to lead to overshooting and a possible capital flight out of these economies. In such circumstances the economies are severely constrained in putting the types of policies in place which are currently pursued in most of Western Europe, the USA and Japan, that is of backing up their banking system through recapitalization and through fiscal stimulus packages. Given the rather low levels of public debt in most of the CEE and SEE economies and the need to reinitiate the operation of the credit system, such policies have as much justification to be pursued in these economies as in the higher income countries. We hence advocate a determined approach by EU institutions and a coordinated approach by EU governments (in cooperation with IFIs) to back up a measured process of real exchange rate adjustment (in both flexible and fixed exchange rate countries) and to provide the backing necessary to pursue growth initiating policies in these economies.